Breath, Strength, Integrity, Spirit… and Walking in Beauty. Forrest Yoga has been created to relieve the stress of living in the 21st century — physically and mentally. Central to each class is breath and the themes/intentions set in class are designed to get you connected to your body – even places where you may have ‘numbed out’ because of injury or you just plain don’t like that bit of you. Forrest Yoga connects you to your heart and — importantly — eventually, your spirit — a gift that you can take with you off the mat and into everyday life. The Forrest Yoga physical practice is strong, however one of the principles is learning how to work struggle-free. We generally practice in a warmed room to encourage muscle tissue movement as well as detoxification. You’ll find that you hold poses for longer than in most yoga classes too. Forrest Yoga classes are beautifully and intelligently sequenced so that your body feels ready for the more difficult asanas (yoga poses). Forrest Yoga is best known for it’s core exercises and 8 ‘basic moves’, which contrary to many styles of yoga, include ‘relaxing the neck’. Towards the end of each class, you’ll be warmed down specifically to down-regulate the nervous system, so that when you leave your Forrest Yoga class, you’ll feel good. Ana Forrest is an incredible woman. 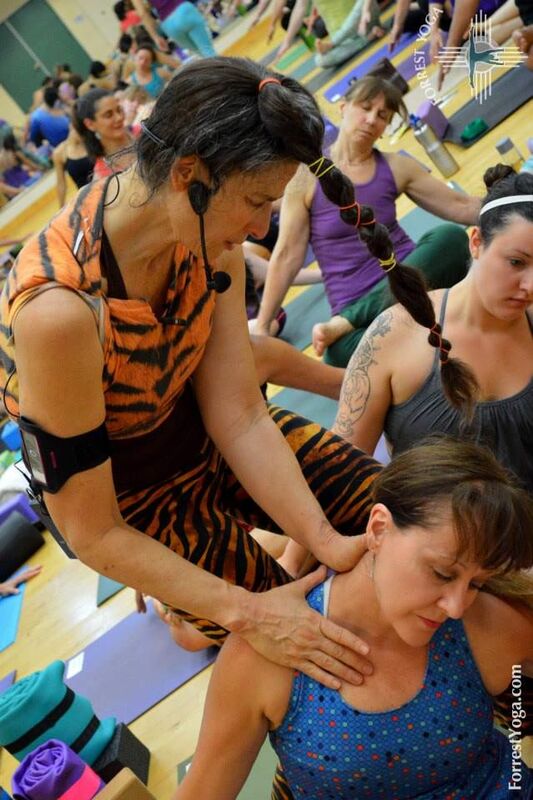 Not only is she a globally respected yoga teacher, Medicine Woman and author of Fierce Medicine, she is a fantastic example of how against all odds, you can heal yourself physically and emotionally. Ana is a huge advocate of cutting through (I quote!) ‘Bullsh*t’ and apathy’ in life! With it’s roots in Native American ceremony, Forrest Yoga taps into the Native American Medicine principles. In Forrest Yoga you get to use your time on the mat as a meditation or ‘Vision Quest’ to learn more about yourself and uncover the real you. Ana encourages all humans to get on our Wind Horse and Walk in Beauty. In other words — breathe deeply and notice the beauty in yourself, others and the world around you. That way you make a difference and your life becomes way more exciting!